BOSTON, Mass. – Wellesley and Canton (18-4-3) combined to hold opponents to only 48 goals in 47 games this season, including just three goals apiece during their three tournament games leading into Sunday afternoon’s Div. 2 state championship game at the TD Garden. It was no surprise then that scoring was at a premium in the final. Jenna Harrison’s goal with only 4.7 seconds remaining in the first period turned out to be enough to lift Wellesley, which was in its fourth trip to the TD Garden in the past five years, to a 1-0 victory and the state title. The Raiders dominated puck possession and created far more scoring opportunities than the Bulldogs, who found their chances limited throughout the game. Senior goalie Colleen Kelleher put in another stellar performance in net, stopping 30 shots in her final game for Canton. 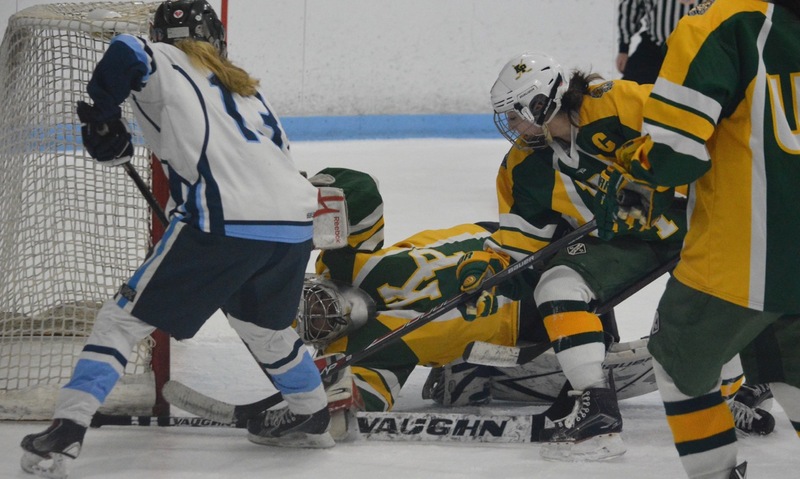 “Another big game by Colleen,” said Aldrich feigning a yawn about his senior goalie who has been consistently strong in helping Canton get to the TD Garden in each of the last two seasons. “I’m trying to red-shirt her by the way. She’s a heck of a player…and she’s the first one to pass it off to her teammates and that’s what makes her special. Canton was limited to just eight shots in the game. The offense was stymied by the talented Wellesley defense, which blocked a number of shots to protect sophomore goalie Liddy Schultz and kept the Canton attackers to the outside. Olivia Vernon had the first good chance for Wellesley, forcing Kelleher into a glove save three minutes into the game, and Erin Fleming skated to the right circle to bring out a blocker save. Canton took seven minutes before creating its first scoring chance. Alexa Maffeo’s shot from the point picked out freshman Lizzie Tassinari on the near post but Schultz got down quickly to block. Wellesley nearly took the lead with three minutes left in the first after Kelleher’s initial save went straight to Lauren Ruggiero but the rebound effort slid just wide. Tassinari drew a save out of Schultz that fellow freshman Maria Femia followed up but also could not beat the Raiders goalie. A warning shot came with 30 seconds left in the period when Mackenzie O’Neil got free on the right side, but fired her shot just wide. With the clock ticking down in the period, Wellesley finally made its dominance pay with a great individual effort. Harrison dragged the puck through her legs and dangled past three Canton defensemen before lifting a shot past Kelleher. The rest of the game followed a similar pattern of Wellesley getting a number of shots on Kelleher, while the Bulldogs struggled to get into the transition game that made its offense so potent during the season. Kelleher made a kick save to deny Isabelle Kressy from the slot and made a pair of quick saves to keep out Catherine Crosier and then the rebound shot from Bliss Vernon. In the third period, she also stuffed O’Neil on the edge of the crease and then seconds later on a one-timer from the right circle. Canton created few chances but in the second period the Bulldogs nearly pulled even. SeniorKatie Halloran skated down the near boards and picked out freshman Ellie Rae Roberts, who was all alone in front. Roberts struggled to handle the pass and then rushed a backhand effort on goal that Schultz pushed aside. It was the only shot that Canton would put on target in the period. Despite experiencing the TD Garden ice for the first time, the freshmen on the second and third lines put in impressive shifts for the Bulldogs on Saturday. 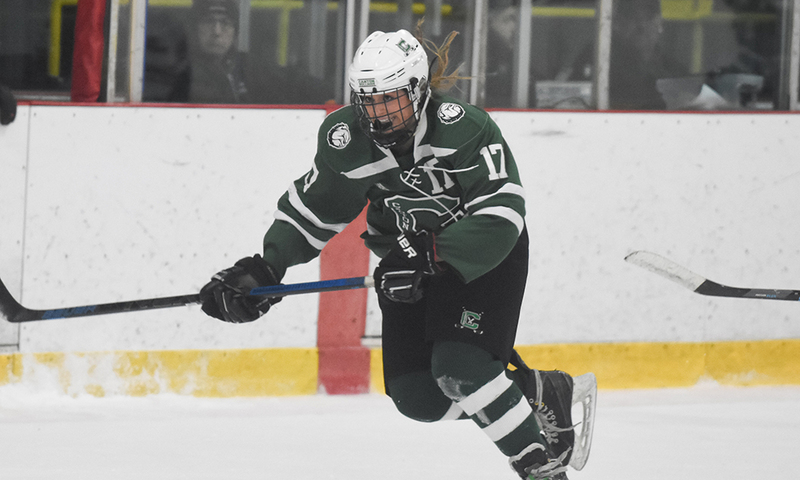 The other great chance came only a minute later when Maggie Malloy found room on the near boards and sent a near-perfect pass across the crease to Lauren Fitzpatrick, but it went straight through with Schultz stranded. Malloy came into the game having scored six goals in three playoff games, including all three game-winners, but she struggled to consistently get on the puck in the final. The top line, which includes Kendra Farrelly, Malloy, and Fitzpatrick, had all but one of Canton’s goals in the postseason but managed very few shots on goal in the final. Malloy had one inside the final six minutes but that would be Canton’s last of the game. Aldrich also praised his group of seniors, including a few who do not see much time on the ice but got the chance to skate at the TD Garden in the final nine seconds after a late penalty on the Bulldogs forced them into a defensive zone face-off. “These guys were with us when we played our last game at Ponkapoag Rink and the next year the rink went down and we were a road team all over the place,” he said. “These guys were there. They played the first game in our new rink and brought us to the Garden the last two years, so for them I’m just so thrilled. BRIGHTON, Mass. – Last winter, Canton was the No. 14 seed, an underdog and an afterthought for many of the people picking favorites to make a run at a state championship. This season, the Bulldogs have been considered Div. 2 title contenders for months and earned the No. 2 seed coming into the tournament. There was no sneaking up on opponents this year, instead Canton has had to deal with the weight of high expectations. While the journey has been very different from last year to this one, the end result is the same. 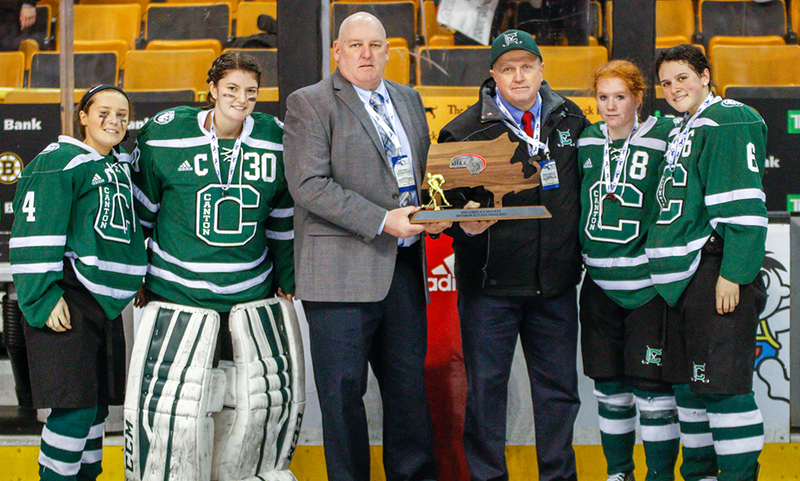 Canton will be heading to the TD Garden to play for the state title on the final day of the winter season. The Bulldogs earned their spot in the final with a 1-0 victory over third-seeded Archbishop Williams on Monday night at the Warrior Ice Arena courtesy of 16 saves from senior goalie Colleen Kelleher and a goal from junior Maggie Malloy, her sixth of the postseason. “Last year was insane,” Kelleher explained. “We had no idea we could even do that, it was a joke. We just kept going, game after game, but this year it was more like, we have to make it back and we have to get our second chance and we have to win. I think we were a little more motivated this time but it still feels just as sweet. The Bulldogs got off to a strong start to the state semifinal, suffering no hangover from last week’s win over Notre Dame Academy (Hingham) that avenged last year’s title game defeat. Andrea McNeil set up Maria Femia for a golden scoring opportunity just five minutes in only to be denied the opener by Archies goalie Allison Delmonte. Two minutes later, Lauren Fitzpatrick drove at the net from the left circle but a last-second poke check by the goalie kept her from getting off a shot. McNeil stole the puck on the forecheck but missed the net from the slot and freshman Lizzie Tassinari managed to get off a shot while falling down and forced a pad stop. Kendra Farrelly nearly picked the top corner only to have Delmonte get her shoulder to the first try and also block Farrelly’s follow up. Canton finished with six shots in the first, despite controlling most of the play and keeping Archies on its heels. The Bulldogs kept pressing at the start of the second with the forecheck continuing to cause problems for the Bishops, forcing turnovers and leading to shots on goal. The Canton forwards were also putting in shifts in the defensive zone and one backcheck by Femia allowed her to break out quickly and create an odd-man rush with Tassinari but again Delmonte made the save. The breakthrough finally came with 8:42 left in the second. 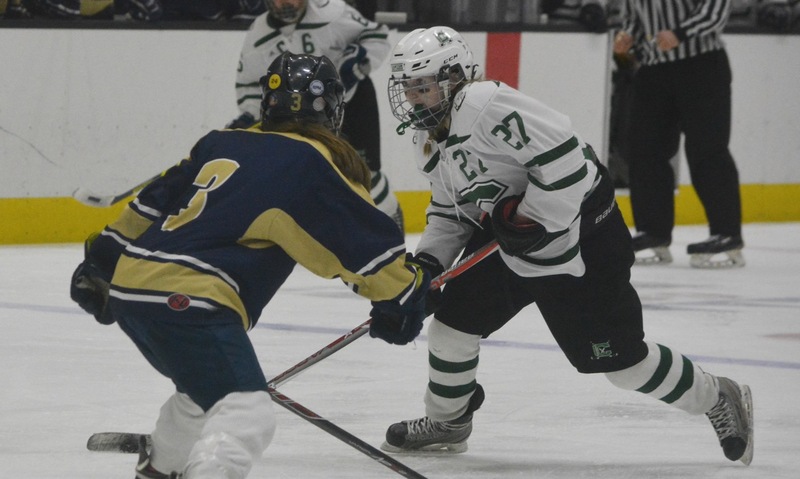 Malloy, who also scored the game-winners in each of Canton’s two previous playoff games this season, showed off her speed in the neutral zone after an outlet by Alexa Maffeo and got space in the right circle. As she angled towards goal, she fired an unstoppable shot just under the bar for the 1-0 lead. Femia and Tassinari continued to cause fits on the second line with both having good scoring chances in the second and Fitzpatrick got free for a shot after Leah McClellan managed to keep a puck in at the blue line. Before the game, Aldrich talked about trying to wear Archies down and in the second period he used his third line of Marissa Devane, Ellie Rae Roberts, and Katie Halloran a few times to try and add a little energy and give his other lines a short breather. Canton gave Archies the chance to get back into the game with three penalties in the third period, but the Bulldogs were so aggressive on the kill that the Bishops struggled at times to get the puck out of their defensive zone. McNeil and Malloy both had chances to seal the win but Delmonte continued to be stout in the Archies goal. Kelleher was largely untroubled on the other end of the ice with the biggest save of note being a second period stop on Mackenzie Heath after she skated in all alone. With 4:35 remaining in the game, Kelleher was called on again after Hanna Bell spun in the slot and fired a snap shot that the Canton goalie was able to kick aside. It was a solid stop, especially since Kelleher had been mostly a spectator as the Bulldogs jumped out to a 10-1 advantage in shots in the third. Archies finished with a flurry, desperately seeking the tying goal. Heath had the final scoring opportunity as she pinched in from the point on the power play, but her shot was saved by Kelleher. At the final horn, the Canton players raced to their goalie to celebrate. This tournament run may be different than last year, but in the end that feeling of knowing that you are playing for a state title remains. Canton (18-3-3) will face top seed Wellesley in the Div. 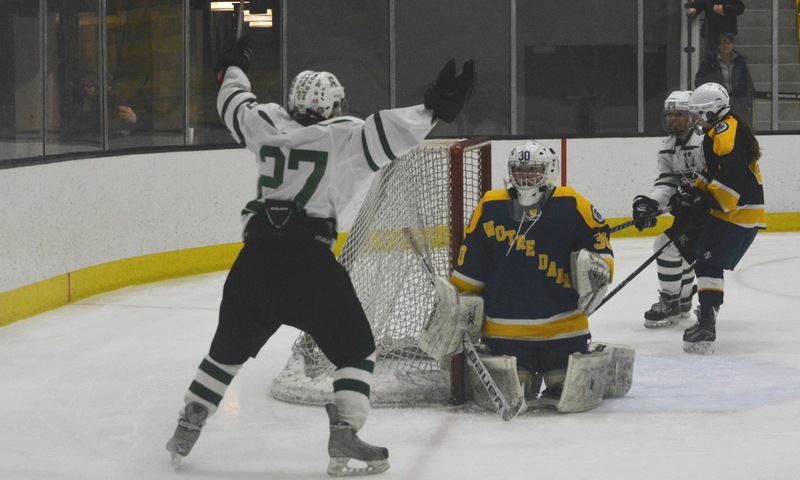 2 state championship game on Sunday at the TD Garden, time to be determined.